This Companion illustrates the vitality and diversity of dramatic work 1660 to 1710. Essays by leading scholars in the field bring together the best recent insights into the full range of dramatic practice and innovation at the time. Introduces readers to the recent boom in scholarship that has revitalised Restoration drama. 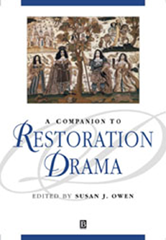 Explores historical and cultural contexts, genres of Restoration drama, and key dramatists, among them Dryden and Behn.